Tiny grey/black specks on non-slip decks? Shenzhen Triton Trading Ltd takes on full Ensearch product range. Mould & Mildew on covers? "Not just a summer coat, a winter overcoat too"
US Fisherman boat "like new" with Boaters' Grail! Great press review from Sailing Today for Ensearch! 10 for 10: Celebrate Abbie’s incredible 10km swim with 10% off all orders! Hosepipe ban lifted but Enseach copes with drought! Don’t let the hosepipe ban affect your boat cleaning! Read the instructions for a perfect finish! We are socialising - on Twitter and Facebook! It's spring - time to get cleaning! London Boat Show a Sell out! Hosted by TCS Chandlery Ensearch will be exhibiting its innovative polishing product the Boaters’ Grail, which is designed to give gelcoat colour back its shine. The Boaters’ Grail leaves an innovative reflective glass-like layer to enhance colour, instead of the traditional surface-eroding ‘cut and polish’ method. The Boaters’ Grail is just one of the full range of cleaning products that Ensearch will be exhibiting at TCS Chandlery, including cleaners and polishes for yachts, dinghies, RIB and covers. The Boaters’ Grail effortlessly brings a shine to all gelcoats from the whitest of whites to the darkest of colours. The Boaters’ Grail also enhances faded and sun bleached colours such as dark blue, green and red. Ensearch is the leading manufacturer of environmentally friendly boat cleaning products and its new flagship product, the Boaters’ Grail, works by spreading as a thin clear liquid which quickly dries leaving a microscopically thin glass-like layer which reflects light back in a manner which intensifies the original colour and leaves a sparkling shine. It is very easy to use, because there’s hardly any work involved. Just spray it on, wipe over for an even finish and allow it to dry. The Boaters’ Grail can be purchased from Ensearch’s online shop at www.ensearch.co.uk as well as from chandlers around the UK. Recommended retail price £19.50 inc. VAT for a 250ml spray bottle. ‘Like anything it needs a degree of cleaning to keep it looking great’. All Over Boat Cleaner from Ensearch, with great results. Known for their scientific & non-abrasive approach to boat cleaning and maintenance Ensearch’s All Over Boat Cleaner will not damage decking like many treatments some of which are abrasive but gently remove ingrained dirt and grime. 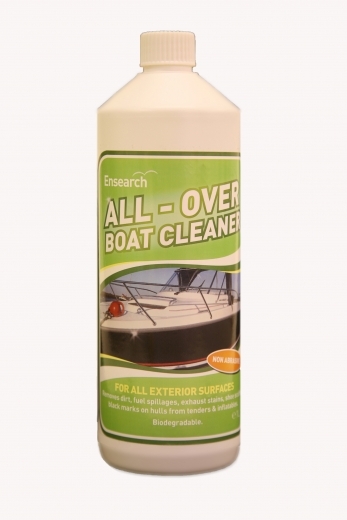 Ensearch’s All Over Boat Cleaner tackles a range of dirt and stains including fuel spillages, exhaust stains, shoe scuffs, algae and mould, bird droppings, grey run marks plus black marks from fenders. It comes in a highly concentrated form which diluted ensures a little goes a long way! 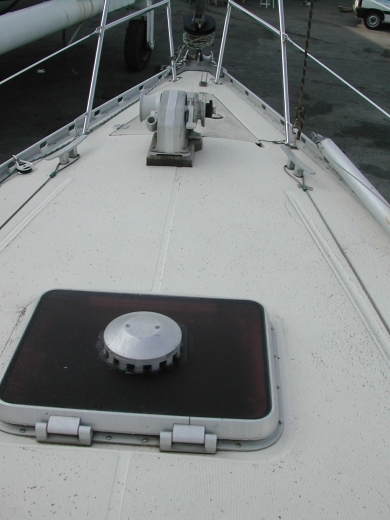 This may simply be dirt trapped in the non-skid pattern, in which case Ensearch All-Over Boat Cleaner will do the trick, but - look closely, very closely - these specks may actually be minute pin-head sized holes in the gelcoat. This is particularly common in diamond-patterned and similar surfaces and results from the original manufacture of the boat. Such patterns are reversed in the mould from which the deck is taken, in other words the diamond which is raised on the deck is a hollow in the mould. Being small and pointed it is easy for a tiny amount of air to become trapped either when gelcoat is applied to the mould or, following application of gelcoat, the lay-up resin is applied. In the former case this results in the generally darker lay-up resin being visible from new or, in the latter case, a small bubble of air being trapped beneath the relatively thin gelcoat. Scuffing by shoes or general wear and tear can easily remove the gelcoat thereby revealing a tiny dark hole. Waterline staining is always a problem but in some areas it is extreme. Ensearch FibreglassHull Cleaner is designed to remove these stubborn stains from gelcoat without the need for rubbing and scrubbing. The bleach-free formula gives a highly engineered product that draws out deposits so they can simply be washed off. We applied the product went for a pleasant walk and 20 minutes later returned to find the results. Although familiar with the magic of Fibreglass Hull Cleaner the Ensearch team are still impressed every time they see it perform, a bit like when you were young (remember those days) and your Dad produced the coin from behind your ear. How did he do that!? Just before Christmas, approved Ensearch training provider (GRPro-clean Thames) Ltd were invited to China providing technical support and training to all Triton Trading staff in a variety of significant marinas in the Shenzhen bay area.